14 | October | 2014 | Coyote Moon, Inc.
IDG, the parent company of Macworld and the Macworld/iWorld Expo, announced that there will be no 2015 expo, and that the expo and conference are taking a hiatus. 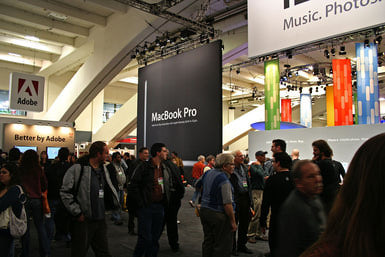 Macworld Expo and Conference began in San Francisco in 1985, and quickly became the premier Apple and Mac trade show event. Apple used the Macworld show as a platform to announce many of its signature products over the years, including iMacs, iPods, and iPhones. The Apple keynote address was always the big-ticket item, with media and fans doing their best to be in the crowd when a new product was launched.